I have learned some things along the way. 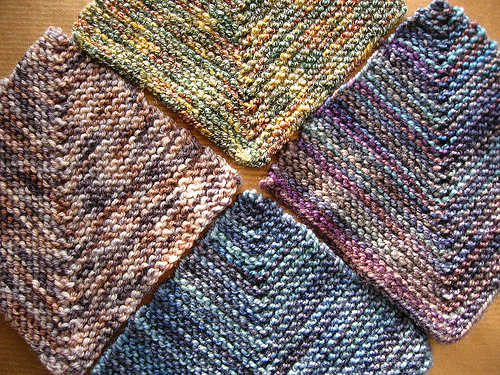 Have you ever been tempted to knit an afghan? If you are a knitter, I would be willing to bet that you have at least toyed with the idea. After all, knitting is warm! So are afghans! On the face of it, it seems like a match made in heaven. And it is… if someone else knits the darned thing. Here is the truth: have you ever been halfway through a scarf and gotten cataclysmically bored with it? As in, "If I knit one more stitch on this thing and it isn't done, I will kill myself"? Sure you have. That is why so many knitters walk around wearing scarves that are only two feet long and calling it "a tuck-in." Allow me to blow your mind: an average size afghan is basically like knitting at least eight scarves, one after the other. Maybe more. I have been working on a knit afghan since July 4th. I am almost done with it. I started it in summer, and it will be well into fall by the time it is finished. And I have devoted my full knitting attention to it. That's not a half-hearted, "I'll work on it tomorrow" knitting rate. I have been giving it my all. And over two months later, it's still not done! I have learned some things along the way, though. By observing the progress of my friends and the status of various Ravelry projects, I have come to the conclusion that an afghan where you have to assemble the pieces at the end is an afghan that, statistically, will only be finished about 10% of the time. I can understand this. You get to the end of knitting all that fabric, and then you have to sew it all up? That's madness! Stuff those squares in a closet and get on with your life. Better, then, to choose an afghan that is seamless. Or to maintain a strict discipline of sewing up each piece as you finish it. The same is true of ends. Weave in the ends as you go, or at least at the end of each row. If you hit the end of the afghan and you have every single end left to weave in, you may as well just save yourself the storage space and burn the thing now. I have also learned that no afghan should ever be made in any yarn smaller than DK weight. There are people who will try to convince you to knit a whole afghan in sock yarn. It is of the utmost importance that you ignore these people! Knitting an afghan in sock yarn is a guaranteed trip to the loony bin.